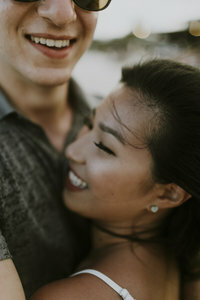 Peter and Izabella have been so much fun to plan a travel-themed engagement shoot with! Their upcoming July wedding at Liuna Station has a vintage travel theme that was a perfect fit for their engagement photos at the Markham Museum. Making use of old steam trains, a vintage train station, and the romance of the in-bloom apple blossoms was an amazing way to help prepare our vision for the wedding of this beautiful couple. Stylistically, Izabella’s floral printed hip pleat skirt was an amazing way to add timeless fashion into this vintage-styled shoot, and paired with her choice of statement jewelry create such a beautiful look I adore. I love that Peter chose to wear a suit jacket for this shoot; without a formal tie, his look is casual but sophisticated and it completed the vibe this couple was going for. Thanks for choosing us to work with you Peter & Izabella! We can’t wait to see your wedding day come together with all of the details you so perfectly plan to pull together.